I’ve always said there are more reasons to raise backyard chickens than just the fresh eggs – as good as that reason may be. 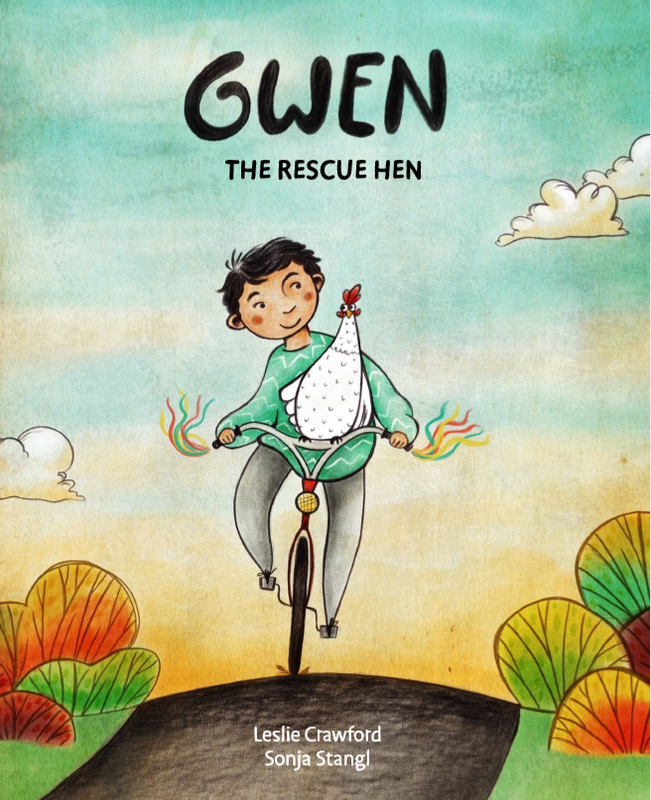 Three other great reasons – to promote humane food production, to educate children about animals, and to have wonderful family pets – are explored in a delightful new children’s book, Gwen the Rescue Hen. Based on a true story (as true as a chicken story can be), Gwen the Rescue Hen is the account of a factory farm hen who escapes from confinement to discover the world. Authored by Leslie Crawford and illustrated by Sonja Stangl, the book quietly makes a case for animal rights while teaching children about one particular animal – the chicken. Gwen’s story begins in the monochromatic world of an egg production warehouse. Sharing a tiny cage with several other hens, she can only dream of spreading her wings to fly. Suddenly, a ferocious tornado sweeps her cage away, thrusting Gwen into a strange and colorful new world. After several narrow escapes from danger, she is rescued by Mateo, an 11-year-old boy. Together, they discover all the things a chicken can do – when given a chance. Geared to children ages 4 to 7, the story’s entertaining prose and captivating illustrations will engage young readers. And the book’s subtle messages about the animals we use will teach them compassion. A bonus section at the end offers a number of interesting facts about chickens’ intelligence, characteristics and traits. Chickens use up to 24 different sounds to communicate, can learn tricks, and are able recognize and remember their chicken friends after months apart. These fun facts make a serious case for adopting a rescue hen as a pet! Due November 6 by Stone Pier Press, Gwen the Rescue Hen is the second book in the Farm Animal Rescue series. It follows Sprig the Rescue Pig, another “true” story released in April 2018. Either would make a great holiday gift for the young readers in your life. Gwen the Rescue Hen is available on Amazon.com. Simply click on the image below for my affiliate link. A review copy of this book was provided by the publisher. However, all opinions expressed herein are my own. This entry was posted in Raising Chickens and tagged backyard chickens, book review, rescue chickens by Deborah Neyens. Bookmark the permalink.